All 2018 General Officer announcements for the Army, Air Force and Marine Corps. General Officer ranks include Brigadier General (one-star), Major General (two-star), Lieutenant General (three-star), General (four-star). Five-Star ranks are generally reserved for war time use. Pay grades are 0-7 and above. See here for the 2019 General Officer announcements. Air Force Lt. Gen. Arnold W. Bunch Jr. for appointment to the rank of general, and assignment as commander, Air Force Materiel Command, Wright-Patterson Air Force Base, Ohio. Bunch is currently serving as military deputy, Office of the Assistant Secretary of the Air Force for Acquisition, Pentagon, Washington, District of Columbia. Air Force Maj. Gen. Duke Z. Richardson for appointment to the rank of lieutenant general, and assignment as military deputy, Office of the Assistant Secretary of the Air Force (Acquisition, Technology and Logistics), Pentagon, Washington, District of Columbia. Richardson is currently serving as Air Force program executive officer for presidential airlift recapitalization, Air Force Life Cycle Management Center, Air Force Materiel Command, Wright-Patterson Air Force Base, Ohio. Air Force Col. David W. Abba has been nominated for appointment to the rank of brigadier general. Abba is currently serving as the commander, 53d Wing, Air Combat Command, Eglin Air Force Base, Florida. Air Force Col. Christopher R. Amrhein has been nominated for appointment to the rank of brigadier general. Amrhein is currently serving as the commander, 100th Air Refueling Wing, U.S. Air Forces Europe and Air Forces Africa, Royal Air Force Mildenhall, United Kingdom. Air Force Col. Charles D. Bolton has been nominated for appointment to the rank of brigadier general. Bolton is currently serving as the deputy director for Operations and Communications, Headquarters Air Education and Training Command, Joint Base San Antonio-Randolph, Texas. Air Force Col. Larry R. Broadwell Jr. has been nominated for appointment to the rank of brigadier general. Broadwell is currently serving as the executive officer to the Chief of Staff, U.S. Air Force, Headquarters U.S. Air Force, Pentagon, Washington, District of Columbia. Air Force Col. Terry L. Bullard has been nominated for appointment to the rank of brigadier general. Bullard is currently serving as the vice commander, Air Force Office of Special Investigations, Office of the Inspector General, Quantico, Virginia. Air Force Col. Scott A. Cain has been nominated for appointment to the rank of brigadier general. Cain is currently serving as the commander, Arnold Engineering Development Complex, Air Force Materiel Command, Arnold Air Force Base, Tennessee. Air Force Col. Jimmy R. Canlas has been nominated for appointment to the rank of brigadier general. Canlas is currently serving as the vice commander, 618th Air Operations Center, Tanker Airlift Control Center, Air Mobility Command, Scott Air Force Base, Illinois. Air Force Col. Julian C. Cheater has been nominated for appointment to the rank of brigadier general. Cheater is currently serving as the commander, 432d Wing and 432d Air Expeditionary Wing, Air Combat Command, Creech Air Force Base, Nevada. Air Force Col. Roy W. Collins has been nominated for appointment to the rank of brigadier general. Collins is currently serving as the chief, Strategic Planning Integration Division, Deputy Chief of Staff, Plans and Programs, Headquarters U.S. Air Force, Pentagon, Washington, District of Columbia. Air Force Col. Colin J. Connor has been nominated for appointment to the rank of brigadier general. Connor is currently serving as the director, Air Force General Officer Management, Office of Air Force Executive Talent Management, Office of the Vice Chief of Staff, U.S. Air Force, Headquarters U.S. Air Force, Pentagon, Washington District of Columbia. Air Force Col. Donald J. Cothern has been nominated for appointment to the rank of brigadier general. Cothern is currently serving as the senior materiel leader and assistant program director, F-35 Development and Production, Air Force Life Cycle Management Center, Air Force Materiel Command, Arlington, Virginia. Air Force Col. David S. Eaglin has been nominated for appointment to the rank of brigadier general. Eaglin is currently serving as the vice director of operations, North American Aerospace Defense Command, Peterson Air Force Base, Colorado. Air Force Col. Steven G. Edwards has been nominated for appointment to the rank of brigadier general. Edwards is currently serving as the special assistant to the commander, United Nations Command, Combined Forces Command, and U.S. Forces Korea, Camp Humphreys, Republic of Korea. Air Force Col. Troy L. Endicott has been nominated for appointment to the rank of brigadier general. Endicott is currently serving as the commander, 460th Space Wing, Air Force Space Command, Buckley Air Force Base, Colorado. Air Force Col. Gregory J. Gagnon has been nominated for appointment to the rank of brigadier general. Gagnon is currently serving as the commander, National Security Agency/Central Security Service Texas, San Antonio, Texas. Air Force Col. Richard W. Gibbs has been nominated for appointment to the rank of brigadier general. Gibbs is currently serving as the commander, 377th Air Base Wing, Air Force Global Strike Command, Kirtland Air Force Base, New Mexico. Air Force Col. Jennifer L. Grant has been nominated for appointment to the rank of brigadier general. Grant is currently serving as the commander, 50th Space Wing, Air Force Space Command, Schriever Air Force Base, Colorado. Air Force Col. Stewart A. Hammons has been nominated for appointment to the rank of brigadier general. Stewart is currently serving as the commander, 27th Special Operations Wing, Air Force Special Operations Command, Cannon Air Force Base, New Mexico. Air Force Col. Robert S. Jobe has been nominated for appointment to the rank of brigadier general. Jobe is currently serving as the chief, Program Integration Division, Deputy Chief of Staff, Plans and Programs, Headquarters U.S. Air Force, Pentagon, Washington, District of Columbia. Air Force Col. John M. Klein Jr. has been nominated for appointment to the rank of brigadier general. Klein is currently serving as a military fellow, Council on Foreign Relations, Air Force Research Institute, Air Education and Training Command, New York, New York. Air Force Col. Gregory Kreuder has been nominated for appointment to the rank of brigadier general. Kreuder is currently serving as the commander, 607th Air and Space Operations Center, Pacific Air Forces, Osan Air Base, Republic of Korea. Air Force Col. Benjamin R. Maitre has been nominated for appointment to the rank of brigadier general. Maitre is currently serving as the director, Legislative Affairs, Headquarters U.S. Special Operations Command, Washington, District of Columbia. Air Force Col. Matteo G. Martemucci been nominated for appointment to the rank of brigadier general. Martemucci is currently serving as the commander, 70th Intelligence, Surveillance, and Reconnaissance Wing, 25th Air Force, Air Combat Command, Fort George G. Meade, Maryland. Air Force Col. Caroline M. Miller has been nominated for appointment to the rank of brigadier general. Miller is currently serving as the chief, Senate Liaison Division, Office of the Legislative Liaison, Office of the Secretary of the Air Force, Pentagon, Washington, District of Columbia. Air Force Col. David A. Mineau has been nominated for appointment to the rank of brigadier general. Mineau is currently serving as the director, Joint and National Security Council Matters, Deputy Chief of Staff, Operations, Headquarters U.S. Air Force, Pentagon, Washington, District of Columbia. Air Force Col. Paul J. Murray has been nominated for appointment to the rank of brigadier general. Murray is currently serving as the chief of staff, Air Combat Operations, U.S. Air Forces Central Command, Air Combat Command, Al Udeid Air Base, Qatar. Air Force Col. Ty W. Neuman, has been nominated for appointment to the rank of brigadier general. Neuman is currently serving as the director, Commander’s Action Group, Headquarters U.S. Strategic Command, Offutt Air Force Base, Nebraska. Air Force Col. John P. Newberry has been nominated for appointment to the rank of brigadier general. Newberry is currently serving as the senior materiel leader, KC-46 system program manager, Air Force Life Cycle Management Center, Air Force Materiel Command, Wright Patterson Air Force Base, Ohio. Air Force Col. Jefferson J. O’Donnell has been nominated for appointment to the rank of brigadier general. O’Donnell is currently serving as the director, Air Force Colonel Management Office, Office of Air Force Executive Talent Management, Office of the Vice Chief of Staff, U.S. Air Force, Headquarters U.S. Air Force, Pentagon, Washington, District of Columbia. Air Force Col. Thomas B. Palenske has been nominated for appointment to the rank of brigadier general. Palenske is currently serving as the military assistant to the under secretary of the Air Force, Office of the Secretary of the Air Force, Pentagon, Washington, District of Columbia. Air Force Col. Evan L. Pettus has been nominated for appointment to the rank of brigadier general. Pettus is currently serving as the commandant, Air Command and Staff College, Air University, Air Education and Training Command, Maxwell Air Force Base, Alabama. Air Force Col. Christopher S. Povak has been nominated for appointment to the rank of brigadier general. Povak is currently serving as the commander, Space Operations Wing, National Reconnaissance Office, Buckley Air Force Base, Colorado. Air Force Col. Bradley L. Pyburn has been nominated for appointment to the rank of brigadier general. Pyburn is currently serving as the senior executive officer to the Vice Chief of Staff, U.S. Air Force, Headquarters U.S. Air Force, Pentagon, Washington, District of Columbia. Air Force Col. Chad D. Raduege has been nominated for appointment to the rank of brigadier general. Raduege is currently serving as the director, Cyberspace and Information Dominance, Headquarters Air Combat Command, Joint Base Langley-Eustis, Virginia. Air Force Col. Michael T. Rawls has been nominated for appointment to the rank of brigadier general. Rawls is currently serving as the commander, 435th Air Ground Operations Wing and the 435th Air Expeditionary Wing, U.S. Air Forces in Europe and Air Forces Africa, Ramstein Air Force Base, Germany. Air Force Col. Ryan R. Samuelson has been nominated for appointment to the rank of brigadier general. Samuelson is currently serving as the executive officer to the commander, U.S. Transportation Command, Scott Air Force Base, Illinois. Air Force Col. David J. Sanford has been nominated for appointment to the rank of brigadier general. Sanford is currently serving as the associate director, Resource Integration, Deputy Chief of Staff for Logistics, Engineering and Force Protection, Headquarters U.S. Air Force, Pentagon, Washington, District of Columbia. Air Force Col. David G. Shoemaker has been nominated for appointment to the rank of brigadier general. Shoemaker is the executive assistant to the commander, Pacific Air Forces, Joint Base Pearl Harbor-Hickam, Hawaii. Air Force Col. Rebecca J. Sonkiss has been nominated for appointment to the rank of brigadier general. Sonkiss is currently serving as the commander, 89th Airlift Wing, Air Mobility Command, Joint Base Andrews, Maryland. Air Force Col. Claude K. Tudor Jr. has been nominated for appointment to the rank of brigadier general. Claude is currently serving as the commander, 24th Special Operations Wing, Air Force Special Operations Command, Hurlburt Field, Florida. Air Force Col. Daniel H. Tulley has been nominated for appointment to the rank of brigadier general. Tulley is currently serving as the senior military assistant to the Secretary of the Air Force, Office of the Secretary of the Air Force, Pentagon, Washington, District of Columbia. Air Force Col. Jeffery D. Valenzia has been nominated for appointment to the rank of brigadier general. Valenzia is currently serving as the executive assistant to the commander, North American Aerospace Defense Command and U.S. Northern Command, Peterson Air Force Base, Colorado. Air Force Col. John C. Walker has been nominated for appointment to the rank of brigadier general. Walker is currently serving as the director, Joint Staff Legislative Affairs, Office of the Chairman of the Joint Chiefs of Staff, Pentagon, Washington, District of Columbia. Air Force Col. Steven P. Whitney has been nominated for appointment to the rank of brigadier general. Whitney is currently serving as the senior materiel leader and director Global Positioning Systems Directorate, Space and Missile Systems Center, Air Force Space Command, Los Angeles Air Force Base, California. Marine Corps Reserve Brig. Gen. Bradley S. James has been nominated for appointment to the rank of major general. James is currently serving as the commander, Marine Corps Forces Reserve; commander, Marine Corps Forces North; and commanding general, 4th Marine Aircraft Wing, U.S. Marine Corps Forces Reserve, New Orleans, Louisiana. Air Force Maj. Gen. David W. Allvin for appointment to the rank of lieutenant general, and assignment as director for strategy, plans, and policy, J-5, Joint Staff; and for appointment as a senior member of the Military Staff Committee of the United Nations, Joint Staff, Pentagon, Washington, District of Columbia. Allvin is currently serving as vice director for strategy, plans, and policy, J-5, Pentagon, Washington, District of Columbia. Air Force Brig. Gen. Vito E. Addabbo has been nominated for appointment to the rank of major general. Addabbo is currently serving as the mobilization assistant to the commander, Air Force Global Strike Command, Barksdale Air Force Base, Louisiana. Air Force Brig. Gen. Maureen G. Banavige has been nominated for appointment to the rank of major general. Banavige is currently serving as the mobilization assistant to the commander, Air Force Sustainment Center, Air Force Materiel Command, Tinker Air Force Base, Oklahoma. Air Force Brig. Gen. Brian K. Borgen has been nominated for appointment to the rank of major general. Borgen is currently serving as the mobilization assistant to the director of operations, Headquarters Air Combat Command, Joint Base Langley-Eustis, Virginia. Air Force Brig. Gen. John P. Healy has been nominated for appointment to the rank of major general. Healy is currently serving as the director of assessments and analysis; and advisor on Reserve Component Affairs, U.S. European Command, Stuttgart-Vaihingen, Germany. Air Force Brig. Gen. John A. Hickok has been nominated for appointment to the rank of major general. Hickok is currently serving as the mobilization assistant to the deputy chief of staff for logistics, installations and mission support, Headquarters Air Force, Pentagon, Washington, District of Columbia. Air Force Brig. Gen. Jay D. Jensen has been nominated for appointment to the rank of major general. Jensen is currently serving as the director of plans, programs and requirements, Office of the Air Force Reserve, Headquarters U.S. Air Force, Pentagon, Washington, District of Columbia. Air Force Brig. Gen. Linda M. Marsh has been nominated for appointment to the rank of major general. Marsh is currently serving as the mobilization assistant to the commander, Air Force Materiel Command, Wright-Patterson Air Force Base, Ohio. Air Force Brig. Gen. Todd J. McCubbin has been nominated for appointment to the rank of major general. McCubbin is currently serving as the mobilization assistant to the commander, Third Air Force, Ramstein Air Base, Germany. Air Force Brig. Gen. Tyler D. Otten has been nominated for appointment to the rank of major general. Otten is currently serving as the mobilization assistant to the commander, Seventh Air Force, Pacific Air Forces, Osan Air Base, South Korea. Air Force Brig. Gen. Boyd C. L. Parker IV has been nominated for appointment to the rank of major general. Parker is currently serving as the mobilization assistant to the commander, Eighteenth Air Force, Air Mobility Command, Scott Air Force Base, Illinois. Air Force Col. Elizabeth E. Arledge has been nominated for appointment to the rank of brigadier general. Arledge is currently serving as the mobilization assistant to the assistant chief of staff, strategic deterrence and nuclear integration, Headquarters U.S. Air Force, Pentagon, Washington, District of Columbia. Air Force Col. John J. Bartrum has been nominated for appointment to the rank of brigadier general. Bartrum is currently serving as the mobilization assistant to the commander, Air Force Medical Operations Agency, Joint Base San Antonio Lackland, Texas. Air Force Col. Matthew J. Burger has been nominated for appointment to the rank of brigadier general. Burger is currently serving as the commander, 452d Air Mobility Wing, Air Force Reserve Command, March Air Reserve Base, California. Air Force Col. Kenneth R. Council Jr. has been nominated for appointment to the rank of brigadier general. Council is currently serving as the mobilization assistant to the commander, 618th Air and Space Operations Center (Tanker Airlift Control Center), Air Mobility Command, Scott Air Force Base, Illinois. Air Force Col. Derin S. Durham has been nominated for appointment to the rank of brigadier general. Durham is currently serving as the commander, 439th Airlift Wing, Air Force Reserve Command, Westover Air Reserve Base, Massachusetts. Air Force Col. Anita L. Fligge has been nominated for appointment to the rank of brigadier general. Fligge is currently serving as the mobilization assistant to the Chief of the Nurse Corps, Office of the Surgeon General, Headquarters U.S. Air Force, Falls Church, Virginia. Air Force Col. Paul R. Fast has been nominated for appointment to the rank of brigadier general. Fast is currently serving as the mobilization assistant to the commander, U.S. Air Forces Japan and Fifth Air Force, U.S. Pacific Air Forces, Yokota Air Base, Japan. Air Force Col. Christopher A. Freeman has been nominated for appointment to the rank of brigadier general. Freeman is currently serving as the reserve deputy director of operations (J-3), U.S. Southern Command, Miami, Florida. Air Force Col. Constance L. Jenkins has been nominated for appointment to the rank of brigadier general. Jenkins is currently serving as the mobilization assistant to the commander, Ogden Air Logistics Complex, Air Force Materiel Command, Hill Air Force Base, Utah. Air Force Col. Paul E. Knapp has been nominated for appointment to the rank of brigadier general. Knapp is currently serving as the mobilization assistant to the director of operations, Headquarters Air Force Global Strike Command, Barksdale Air Force Base, Louisiana. Air Force Col. Douglas S. Martin has been nominated for appointment to the rank of brigadier general. Martin is currently serving as the mobilization assistant to the commander, Air Force Research Laboratory, Air Force Materiel Command, Wright-Patterson Air Force Base, Ohio. Air Force Col. Jody A. Merritt has been nominated for appointment to the rank of brigadier general. Merritt is currently serving as the mobilization assistant to the commander, Space and Missile Systems Center, Air Force Space Command, Los Angeles Air Force Base, California. Air Force Col. John M. Olson has been nominated for appointment to the rank of brigadier general. Olson is currently serving as the mobilization assistant to the commander, Air Force Nuclear Weapons Center, Air Force Materiel Command, Kirtland Air Force Base, New Mexico. Air Force Col. Stacey L. Scarisbrick has been nominated for appointment to the rank of brigadier general. Scarisbrick is currently serving as the mobilization assistant to the associate director of logistics, Deputy Chief of Staff for Logistics, Engineering, and Force Protection, Headquarters U.S. Air Force, The Pentagon, Washington, District of Columbia. Air Force Col. David W. Smith has been nominated for appointment to the rank of brigadier general. Smith is currently serving as the mobilization assistant to the director, operational capability requirements, Deputy Chief of Staff for Strategic Plans and Requirements, Headquarters U.S. Air Force, Washington, District of Columbia. Air Force Col. Roger P. Suro has been nominated for appointment to the rank of brigadier general. Suro is currently serving as the commander, 442d Fighter Wing, Air Force Reserve Command, Whiteman Air Force Base, Missouri. Maj. Gen. Sami D. Said for appointment to the rank of lieutenant general, and assignment as the inspector general of the Air Force, Office of the Secretary of the Air Force, Pentagon, Washington, District of Columbia. Said is currently serving as deputy inspector general, Office of the Secretary of the Air Force, Pentagon, Washington, District of Columbia. Air Force Lt. Gen. Jerry D. Harris Jr. for appointment to the rank of lieutenant general, and assignment as deputy chief of staff, Plans and Programs, Headquarters U.S. Air Force, Pentagon, Washington, District of Columbia. Harris is currently serving as deputy chief of staff, Strategic Plans and Requirements, Headquarters U.S. Air Force, Pentagon, Washington, District of Columbia. Marine Corps Maj. Gen. George W. Smith Jr. for appointment to the rank of lieutenant general, and assignment as senior military assistant to the secretary of defense. Smith is currently serving as special assistant to the director, Joint Staff, Washington, District of Columbia. Air Force Maj. Gen. Timothy G. Fay for appointment to the rank of lieutenant general, and assignment as deputy chief of staff, Strategy, Integration and Requirements, Headquarters U.S. Air Force, Pentagon, Washington, District of Columbia. Fay is currently serving as special assistant to the vice chief of staff of the Air Force, Headquarters U.S. Air Force, Pentagon, Washington, District of Columbia. Air Force Col. David P. Garfield has been nominated for appointment to the rank of brigadier general. Garfield is currently serving as the commander, 482nd Fighter Wing, Air Force Reserve Command, Homestead Air Reserve Base, Florida. Marine Corps Lt. Gen. Kenneth F. McKenzie Jr. for appointment to the rank of general, and assignment as commander, U.S. Central Command. McKenzie is currently serving as director, Joint Staff, Washington, District of Columbia. Air Force Maj. Gen. Thomas J. Sharpy for appointment to the rank of lieutenant general, and assignment as deputy chief of staff for Capability Development, Supreme Allied Command Transformation, Norfolk, Virginia. Sharpy is currently serving as deputy commander, Air Mobility Command, Scott Air Force Base, Illinois. Air Force Col. David A. Harris Jr. has been nominated to the rank of brigadier general. Harris is currently serving as director, Strategic Plans, Programs, and Requirements, Headquarters Air Force Special Operations Command, Hurlburt Field, Florida. Air Force Brig. Gen. Steven A. Schaick has been nominated for appointment to the rank of major general, and for assignment as the chief of chaplains, Headquarters U.S. Air Force, Pentagon, Washington, District of Columbia. Schaick is currently serving as the deputy chief of chaplains, Office of the Chief of Chaplains, Headquarters U.S. Air Force, Pentagon, Washington, District of Columbia. Air Force Col. Ronald M. Harvell has been nominated for appointment to the rank of brigadier general. Harvell is currently serving as the command chaplain, Headquarters Mobility Command, Scott Air Force Base, Illinois. Marine Corps Maj. Gen. Frederick M. Padilla for appointment to the rank of lieutenant general, and assignment as commander, U.S. Marine Corps Forces Reserve; and commander, U.S. Marine Corps Forces North. Padilla is currently serving as the director, Joint Capabilities Integration Directorate, Department of Combat Development and Integration, Headquarters, U.S. Marine Corps, Washington, District of Columbia. Air Force Maj. Gen. Jon T. Thomas for appointment to the rank of lieutenant general, and assignment as deputy commander, Air Mobility Command, Scott Air Force Base, Illinois. Thomas is currently serving as director, operations, strategic deterrence, and nuclear integration, Headquarters U.S. Air Forces in Europe – Air Forces Africa, Ramstein Air Base, Germany. Air Force Col. Susan J. Pietrykowski has been nominated to the rank of brigadier general. Pietrykowski is currently serving as the deputy command surgeon, Air Combat Command, Joint Base Langley-Eustis, Virginia. Air Force Lt. Gen. Mark D. Kelly for appointment to the rank of lieutenant general, and assignment as deputy chief of staff, operations, Headquarters U.S. Air Force, Pentagon, Washington, District of Columbia. Kelly is currently serving as commander, Twelfth Air Force (Air Forces Southern), Air Combat Command, Davis-Monthan Air Force Base, Arizona. Air Force Lt. Gen. Kenneth S. Wilsbach for appointment to the rank of lieutenant general, and assignment as deputy commander, U.S. Forces Korea; commander, Air Component Command, United Nations Command; commander, Air Component Command, Combined Forces Command; and commander, Seventh Air Force, Pacific Air Forces, Osan Air Base, Korea. Wilsbach is currently serving as commander, Alaskan Command, U.S. Northern Command; commander, Eleventh Air Force, Pacific Air Forces; and commander, Alaskan North American Aerospace Defense Region, Joint Base Elmendorf-Richardson, Alaska. Air Force Maj. Gen. Christopher P. Weggeman for appointment to the rank of lieutenant general, and assignment as deputy commander, Air Combat Command, Joint Base Langley-Eustis, Virginia. Weggeman is currently serving as commander, 24th Air Force, Air Force Space Command; and commander, Air Forces Cyber, U.S. Cyber Command, Joint Base San Antonio, Texas. Air Force Maj. Gen. Thomas A. Bussiere for appointment to the rank of lieutenant general, and assignment as commander, Alaskan Command, U.S. Northern Command; commander, Eleventh Air Force, Pacific Air Forces; and commander, Alaskan North American Aerospace Defense Region, Joint Base Elmendorf-Richardson, Alaska. Bussiere is currently serving as commander, 8th Air Force, Air Force Global Strike Command; and commander, Joint-Global Strike Operations Center, Barksdale Air Force Base, Louisiana. Marine Corps Lt. Gen. Gary L. Thomas has been nominated for appointment to the rank of general, and assignment as assistant commandant of the Marine Corps. Thomas is currently serving as the deputy commandant for programs and resources, Headquarters, U.S. Marine Corps, Washington, District of Columbia. Air Force Lt. Gen. Thomas W. Bergeson for appointment to the rank of lieutenant general, and assignment as deputy commander, U.S. Central Command, MacDill Air Force Base, Florida. Bergeson is currently serving as deputy commander, United Nations Command Korea; deputy commander, U.S. Forces Korea; commander, Air Component Command, Republic of Korea/U.S. Combined Forces Command; and commander, Seventh Air Force, Pacific Air Forces, Osan Air Base, Republic of Korea. Air Force Maj. Gen. James C. Slife for appointment to the rank of lieutenant general, and assignment as vice commander, U.S. Special Operations Command, Pentagon, Washington, District of Columbia. Slife is currently serving as chief of staff, U.S. Special Operations Command, MacDill Air Force Base, Florida. Marine Corps Maj. Gen. John M. Jansen for appointment to the rank of lieutenant general, and assignment as deputy commandant for programs and resources, Headquarters, U.S. Marine Corps. Jansen is currently serving as the commandant, The Dwight D. Eisenhower School for National Security, National Defense University, Washington, District of Columbia. Marine Corps Maj. Gen. John K. Love for appointment to the rank of lieutenant general, and assignment as U.S. military representative to the North Atlantic Treaty Organization Military Committee. Love is currently serving as the commanding general, 2d Marine Division, Jacksonville, North Carolina. Air Force Lt. Gen. Giovanni K. Tuck for appointment to the rank of lieutenant general, and assignment as director for logistics, J-4, Joint Staff, Pentagon, Washington, District of Columbia. Tuck is currently serving as commander, Eighteenth Air Force, Air Mobility Command, Scott Air Force Base, Illinois. Air Force Maj. Gen. Brian T. Kelly for appointment to the rank of lieutenant general, and assignment as deputy chief of staff, Manpower, Personnel and Services, Headquarters U.S. Air Force, Pentagon, Washington, District of Columbia. Kelly is currently serving as commander, Air Force Personnel Center, Deputy Chief of Staff, Manpower, Personnel and Services, Joint Base San Antonio-Randolph, Texas. Air Force Maj. Gen. Joseph T. Guastella Jr., for appointment to the rank of lieutenant general, and assignment as commander, U.S. Air Forces Central Command, Air Combat Command, Al Udeid Air Base, Qatar. Guastella is currently serving as director of integrated air, space, cyberspace and intelligence, surveillance and reconnaissance operations, Headquarters Air Force Space Command, Peterson Air Force Base, Colorado. Army Lt. Gen. Austin S. Miller for appointment to the grade of general, and assignment as commander, Resolute Support Mission, North Atlantic Treaty Organization; and commander, U.S. Forces-Afghanistan. Miller currently serves as commander, Joint Special Operations Command, Joint Special Operations Command Forward, U.S. Special Operations Command, Fort Bragg, North Carolina. Marine Corps Maj. Gen. Carl E. Mundy III, for appointment to the rank of lieutenant general, and assignment as commander, Marine Corps Forces Central Command. Mundy is currently serving as commander, Marine Corps Forces Special Operations Command, Jacksonville, North Carolina. Marine Corps Maj. Gen. Loretta E. Reynolds for appointment to the rank of lieutenant general, and assignment as deputy commandant for information, Headquarters, U.S. Marine Corps; and commander, U.S. Marine Corps Forces Strategic Command. Reynolds is currently serving as commander, U.S. Marine Corps Forces Cyber Command, Washington, District of Columbia. Marine Corps Lt. Gen. Joseph L. Osterman for appointment to the rank of lieutenant general, and assignment as commanding general, I Marine Expeditionary Force. Osterman is currently serving as the deputy commander, U.S. Special Operations Command, Tampa, Florida. Air Force Lt. Gen. Charles Q. Brown Jr., for appointment to the rank of general, and assignment as commander, Pacific Air Forces; air component commander for U.S. Pacific Command; and executive director, Pacific Air Combat Operations Staff, Joint Base Pearl Harbor-Hickam, Hawaii. Brown is currently serving as deputy commander, U.S. Central Command, MacDill Air Force Base, Florida. Marine Corps Col. Daniel J. Lecce for appointment to the rank of major general and appointment as the staff judge advocate to the commandant of the Marine Corps. Lecce is currently serving as the assistant judge advocate general for military justice and the officer-in-charge of the Navy-Marine Corps Appellate Review Activity, Office of the Judge Advocate General of the U.S. Navy, Washington, District of Columbia. Air Force Lt. Gen. Richard M. Clark has been nominated for appointment to the rank of lieutenant general, and assignment as deputy chief of staff, strategic deterrence and nuclear integration, Headquarters U.S. Air Force, Pentagon, Washington, District of Columbia. Clark is currently serving as commander, Third Air Force, U.S. Air Forces in Europe, Ramstein Air Base, Germany. Air Force Col. Michele C. Edmondson has been nominated to the rank of brigadier general. Edmondson is currently serving as the senior executive officer to the vice chief of staff of the Air Force, Headquarters U.S. Air Force, Pentagon, Washington, District of Columbia. Marine Corps Lt. Gen. Lewis A. Craparotta for appointment to the rank of lieutenant general, and assignment as commander, U.S. Marine Corps Forces Pacific; and commanding general, Fleet Marine Corps Forces Pacific. Craparotta is currently serving as the commanding general, I Marine Expeditionary Force, San Diego, California. Marine Corps Lt. Gen. Daniel J. O’Donohue for appointment to the rank of lieutenant general, and assignment as director, J-7, Joint Staff. O’Donohue is currently serving as the deputy commandant for information, Headquarters, U.S. Marine Corps, Washington, District of Columbia. Marine Corps Maj. Gen. Eric M. Smith for appointment to the rank of lieutenant general, and assignment as commanding general, III Marine Expeditionary Force; and commander, U.S. Marine Corps Forces Japan. Smith is currently serving as the commanding general, 1st Marine Division, San Diego, California. Air Force Lt. Gen. Scott A. Howell for appointment to the rank of lieutenant general, and assignment as commander, Joint Special Operations Command; and commander, Joint Special Operations Command Forward, U.S. Special Operations Command, Fort Bragg, North Carolina. Howell is currently serving as vice commander, U.S. Special Operations Command, Pentagon, Washington, District of Columbia. Air Force Maj. Gen. Warren D. Berry for appointment to the rank of lieutenant general, and assignment as deputy chief of staff for logistics, engineering, and force protection, Headquarters U.S. Air Force, Pentagon, Washington, District of Columbia. Berry is currently serving as deputy commander, Air Force Materiel Command, Wright-Patterson Air Force Base, Ohio. Air Force Maj. Gen. Donald E. Kirkland for appointment to the rank of lieutenant general, and assignment as commander, Air Force Sustainment Center, Air Force Materiel Command, Tinker Air Force Base, Oklahoma. Kirkland is currently serving as director of logistics, Deputy Chief of Staff for Logistics, Engineering and Force Protection, Headquarters U.S. Air Force, Pentagon, Washington, District of Columbia. Marine Corps Reserve Brig. Gen. Michael F. Fahey III has been nominated for appointment to the rank of major general. Fahey is currently serving as the commanding general, Force Headquarters Group, U.S. Marine Corps Forces Reserve Command, New Orleans, Louisiana. Marine Corps Reserve Brig. Gen. Helen G. Pratt has been nominated for appointment to the rank of major general. Pratt is currently serving as the commanding general, 4th Marine Logistics Group, U.S. Marine Corps Forces Reserve Command, New Orleans, Louisiana. Air Force Lt. Gen. Bradford J. Shwedo for appointment to the rank of lieutenant general, and assignment as director for command, control, communications, and computers/cyber; and chief information officer J6, Joint Staff, Pentagon, Washington, District of Columbia. Shwedo is currently serving as chief, information dominance; and chief information officer, Office of the Secretary of the Air Force, Pentagon, Washington, District of Columbia. Marine Corps Maj. Gen. Charles G. Chiarotti for appointment to the rank of lieutenant general, and assignment as deputy commandant for installations and logistics, Headquarters, U.S. Marine Corps. Chiarotti is currently serving as the deputy commander, U.S. Forces Japan, Yokota Air Base, Fussa, Japan. Air Force Gen. Terrence J. O’Shaughnessy for appointment to the rank of general, and assignment as commander, U.S. Northern Command; and commander, North American Aerospace Defense Command, Peterson Air Force Base, Colorado. O’Shaughnessy is currently serving as commander, Pacific Air Forces; air component commander for U.S. Pacific Command; and executive director, Pacific Air Combat Operations Staff, Joint Base Pearl Harbor-Hickam, Hawaii. Marine Corps Lt. Gen. Michael G. Dana for appointment to the rank of lieutenant general, and assignment as director of the Marine Corps Staff. Dana is currently serving as the deputy commandant for installations and logistics, Headquarters, U.S. Marine Corps, Washington, District of Columbia. Marine Corps Lt. Gen. David H. Berger for appointment to the rank of lieutenant general, and assignment as deputy commandant for combat development and integration, Headquarters, U.S. Marine Corps; and commanding general, Marine Corps Combat Development Command. Berger is currently serving as the commander, U.S. Marine Corps Forces Pacific; and commanding general, Fleet Marine Corps Forces Pacific, Honolulu, Hawaii. Marine Corps Col. Stephen E. Liszewski has been nominated for appointment to the rank of brigadier general. Liszewski is currently serving as the military assistant to the Secretary of the Navy, Washington, District of Columbia. Marine Corps Col. Lorna M. Mahlock has been nominated for appointment to the rank of brigadier general. Mahlock is currently serving as the deputy director of Operations, Plans, Policies, and Operations Directorate, Headquarters, U.S. Marine Corps, Washington, District of Columbia. Marine Corps Col. David L. Odom has been nominated for appointment to the rank of brigadier general. Odom is currently serving as the chief of staff, III Marine Expeditionary Force, Okinawa, Japan. Marine Corps Col. Arthur J. Pasagian has been nominated for appointment to the rank of brigadier general. Pasagian is currently serving as the chief of staff, U.S. Marine Corps Systems Command, Marine Corps Base Quantico, Virginia. Marine Corps Col. Sean M. Salene has been nominated for appointment to the rank of brigadier general. Salene is currently serving as the assistant chief of staff, G-3, II Marine Expeditionary Force, Camp Lejeune, North Carolina. Marine Corps Col. Kevin J. Stewart has been nominated for appointment to the rank of brigadier general. Stewart is currently serving as the executive assistant to the deputy commandant for installations and logistics, Headquarters, U.S. Marine Corps, Washington, District of Columbia. Marine Corps Col. William H. Swan has been nominated for appointment to the rank of brigadier general. Swan is currently serving as the tactical air section head, Aviation Weapons Systems Requirements Branch, Department of Aviation, Headquarters, U.S. Marine Corps, Washington, District of Columbia. Air Force Col. Daniel T. Lasica has been nominated for appointment to the rank of brigadier general. Lasica is currently serving as the commander, 20th Fighter Wing, Air Combat Command, Shaw Air Force Base, South Carolina. Brig. Gen. William J. Walker, Army National Guard, for appointment to the rank of major general, and assignment as commanding general of the Militia of the District of Columbia; and director, District of Columbia National Guard. Brig. Gen. Aaron R. Dean II, Army National Guard, for assignment as adjutant general of the Militia of the District of Columbia; and deputy director, District of Columbia National Guard. 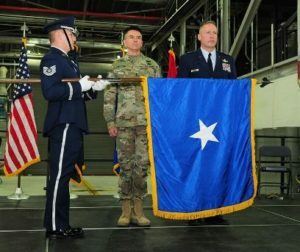 Air Force Lt. Gen. Timothy M. Ray for appointment to the rank of general, and for assignment as commander, Air Force Global Strike Command, Barksdale Air Force Base, Louisiana. Ray is currently serving as deputy commander, U.S. European Command, Stuttgart-Vaihingen, Germany. Air Force Maj. Gen. David D. Thompson for appointment to the rank of lieutenant general, and for assignment as vice commander, Air Force Space Command, Pentagon, Washington, District of Columbia. Thompson is currently serving as special assistant to the commander, Air Force Space Command, Peterson Air Force Base, Colorado. Air Force Col. John J. Allen for appointment to the rank of brigadier general. Allen is currently serving as the director of staff, Headquarters Air Force Materiel Command, Wright-Patterson Air Force Base, Ohio. Air Force Brig. Gen. Vincent K. Becklund has been nominated for appointment to the rank of major general. Becklund is currently serving as the special assistant to the commander, Air Force Special Operations Command, Hurlburt Field, Florida. Air Force Brig. Gen. Charles S. Corcoran has been nominated for appointment to the rank of major general. Corcoran is currently serving as the deputy chief of staff, operations, Headquarters Allied Air Command, North Atlantic Treaty Organization, Ramstein Air Base, Germany. Air Force Brig. Gen. Barry R. Cornish has been nominated for appointment to the rank of major general. Cornish is currently serving as the deputy director for operations, Operations Team Two, National Joint Operations and Intelligence Center, J-3, Joint Staff, Pentagon, Washington, District of Columbia. Air Force Brig. Gen. Christopher E. Craige has been nominated for appointment to the rank of major general. Craige is currently serving as the chief of staff, Headquarters U.S. Air Forces in Europe-Air Forces Africa, Ramstein Air Base, Germany. Air Force Brig. Gen. Andrew A. Croft has been nominated for appointment to the rank of major general. Croft is currently serving as the deputy commanding general–air, Combined Joint Forces Land Component Command–Operation Inherent Resolve; and deputy director, Joint Air Component Coordination Element, Combined Joint Task Force–Operation Inherent Resolve, U.S. Central Command; and deputy commander, 9th Air Expeditionary Task Force-Levant, Air Combat Command, Baghdad, Iraq. Air Force Brig. Gen. Allan E. Day has been nominated for appointment to the rank of major general. Day is currently serving as the director of logistics, civil engineering and force protection, Headquarters Air Force Materiel Command, Wright-Patterson Air Force Base, Ohio. Air Force Brig. Gen. Eric T. Fick has been nominated for appointment to the rank of major general. Fick is currently serving as the deputy director, Joint Strike Fighter Program, Office of the Under Secretary of Defense (Acquisition & Sustainment), Arlington, Virginia. Air Force Brig. Gen. Chad P. Franks has been nominated for appointment to the rank of major general. Franks is currently serving as the vice commander, 14th Air Force (Air Forces Strategic), Air Force Space Command, Vandenberg Air Force Base, California. Air Force Brig. Gen. John R. Gordy II has been nominated for appointment to the rank of major general. Gordy is currently serving as the senior defense official and defense attaché–Turkey, U.S. European Command, Defense Intelligence Agency, Ankara, Turkey. Air Force Brig. Gen. Gregory M. Guillot has been nominated for appointment to the rank of major general. Guillot is currently serving as the chief of staff, Headquarters Pacific Air Forces, Joint Base Pearl Harbor-Hickam, Hawaii. Air Force Brig. Gen. Stacey T. Hawkins has been nominated for appointment to the rank of major general. Hawkins is currently serving as the commander, Ogden Air Logistics Complex, Air Force Materiel Command, Hill Air Force Base, Utah. Air Force Brig. Gen. Cameron G. Holt has been nominated for appointment to the rank of major general. Holt is currently serving as the commander, Air Force Installation Contracting Agency, Air Force Installation and Mission Support Center, Air Force Materiel Command, Wright-Patterson Air Force Base, Ohio. Air Force Brig. Gen. Kevin A. Huyck has been nominated for appointment to the rank of major general. Huyck is currently serving as the deputy director of operations, North American Aerospace Command, Headquarters North American Aerospace Defense Command, Peterson Air Force Base, Colorado. Air Force Brig. Gen. David J. Julazadeh has been nominated for appointment to the rank of major general. Julazadeh is currently serving as the deputy director, Operations, J-3, Headquarters U.S. Central Command, MacDill Air Force Base, Florida. Air Force Brig. Gen. Kevin B. Kennedy has been nominated for appointment to the rank of major general. Kennedy is currently serving as the principal director to the deputy chief information officer for Command, Control, Communications and Computers and Information Infrastructure Capabilities, Office of the Secretary of Defense Chief Information Officer, Office of the Secretary of Defense, Pentagon, Washington, District of Columbia. Air Force Brig. Gen. Kyle J. Kremer has been nominated for appointment to the rank of major general. Kremer is currently serving as the director, manpower and personnel, J-1, Joint Staff, Pentagon, Washington, District of Columbia. Air Force Brig. Gen. Peter J. Lambert has been nominated for appointment to the rank of major general. Lambert is currently serving as the director, Intelligence, Headquarters Air Combat Command, Joint Base Langley-Eustis, Virginia. Air Force Brig. Gen. William J. Liquori Jr. has been nominated for appointment to the rank of major general. Liquori is currently serving as the director, Space Policy, National Security Council, Executive Office of the President, Washington, District of Columbia. Air Force Brig. Gen. Randall Reed has been nominated for appointment to the rank of major general. Reed is currently serving as the senior defense official and defense attaché designate-Turkey, Defense Intelligence Agency, Washington, District of Columbia. Air Force Brig. Gen. Lenny J. Richoux has been nominated for appointment to the rank of major general. Richoux is currently serving as the commander, Joint Enabling Capabilities Command, U.S. Transportation Command, Norfolk, Virginia. Air Force Brig. Gen. Carl E. Schaefer has been nominated for appointment to the rank of major general. Schaefer is currently serving as the commander, 412th Test Wing, Air Force Test Center, Air Force Materiel Command, Edwards Air Force Base, California. Air Force Brig. Gen. John E. Shaw has been nominated for appointment to the rank of major general. Shaw is currently serving as the director, Strategic Plans, Programs, Requirements and Analysis, Headquarters Air Force Space Command, Peterson Air Force Base, Colorado. Air Force Brig. Gen. Brad M. Sullivan has been nominated for appointment to the rank of major general. Sullivan is currently serving as the deputy director, operations, Operations Team 1, National Joint Intelligence Center, J-3, Joint Staff, Pentagon, Washington, District of Columbia. Air Force Brig. Gen. Stephen C. Williams has been nominated for appointment to the rank of major general. Sullivan is currently serving as the director, air and cyberspace operations, Headquarters Pacific Air Forces, Joint Base Pearl Harbor-Hickam, Hawaii. Air Force Brig. Gen. John J. DeGoes has been nominated for appointment to the rank of major general. DeGoes is currently serving as the vice commander, 59th Medical Wing (Wilford Hall), Air Education and Training Command, Joint Base San Antonio-Lackland, Texas. Air Force Brig. Gen. Robert I. Miller has been nominated for appointment to the rank of major general. Miller is currently serving as the commander, Air Force Medical Operations Agency, Office of the Air Force Surgeon General, Joint Base San Antonio, Texas. Air Force Brig. Gen. Lee E. Payne has been nominated for appointment to the rank of major general. Payne is currently serving as the command surgeon, Headquarters Air Mobility Command, Scott Air Force Base, Illinois. Marine Corps Brig. Gen. James W. Bierman Jr., has been nominated for appointment to the rank of major general. Bierman is currently serving as the deputy director, J-5, Joint Staff, Washington, District of Columbia. Marine Corps Brig. Gen. Normal L. Cooling has been nominated for appointment to the rank of major general. Cooling is currently serving as the legislative assistant to the Commandant of the Marine Corps, Washington, District of Columbia. Marine Corps Brig. Gen. David J. Furness has been nominated for appointment to the rank of major general. Furness is currently serving as the commander, Combined Joint Task Force, Horn of Africa, Djibouti. Marine Corps Brig. Gen. John M. Jansen has been nominated for appointment to the rank of major general. Jansen is currently serving as the commandant, The Dwight D. Eisenhower School for National Security and Resources Strategy, National Defense University, Washington, District of Columbia. Marine Corps Brig. Gen. Michael E. Langley has been nominated for appointment to the rank of major general. Langley is currently serving as the deputy commanding general, II Marine Expeditionary Force; and the commanding general, 2d Marine Expeditionary Brigade, Camp Lejeune, North Carolina. Marine Corps Brig. Gen. David A. Ottignon has been nominated for appointment to the rank of major general. Ottignon is currently serving as the inspector general of the Marine Corps, Arlington, Virginia. Marine Corps Brig. Gen. Thomas D. Weidley has been nominated for appointment to the rank of major general. Weidley is currently serving as the commanding general, 1st Marine Aircraft Wing, Okinawa, Japan.